Have a toddler who loves an inquisitive little monkey? Then he or she will love this Curious George Birthday Cake and other party ideas we’re sharing today. 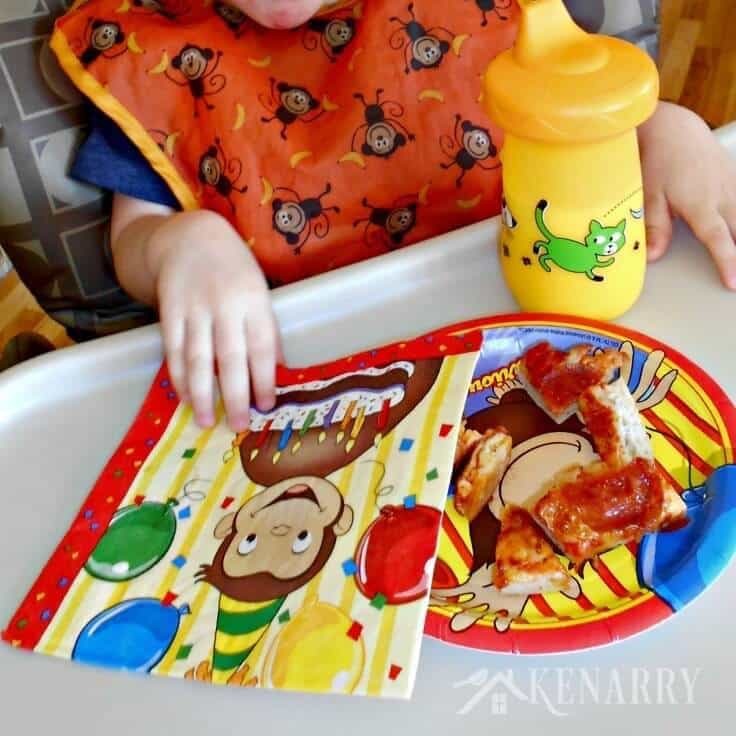 We’ve included where to find plates, napkins and other fun ideas to help make your little monkey’s birthday extra special. I recently shared the John Deere tractor birthday cake I made when our second son turned two a few months ago. 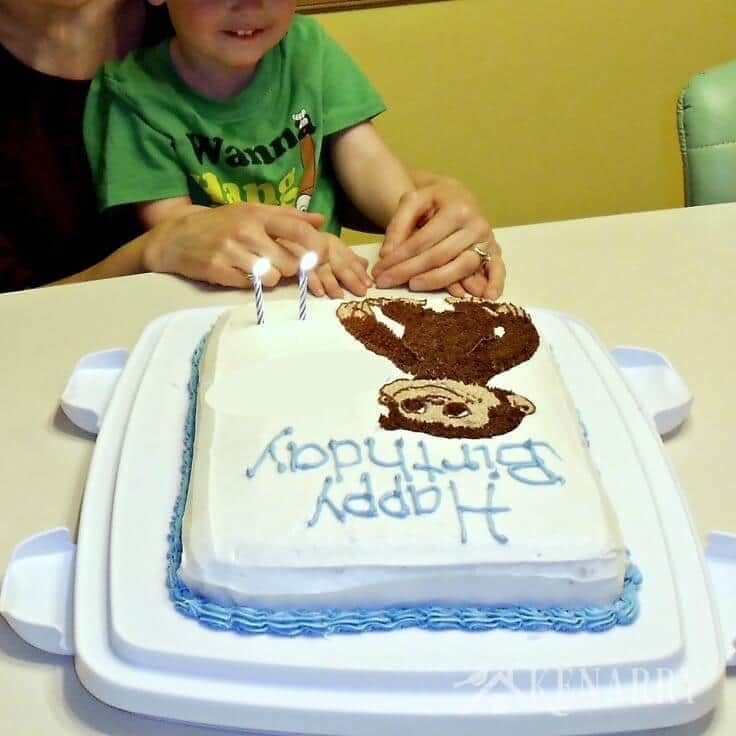 This got me to thinking that I had never shared our older son’s 2nd birthday cake here on Kenarry. It’s hard for me to imagine C1 is going to be 5 years old soon. 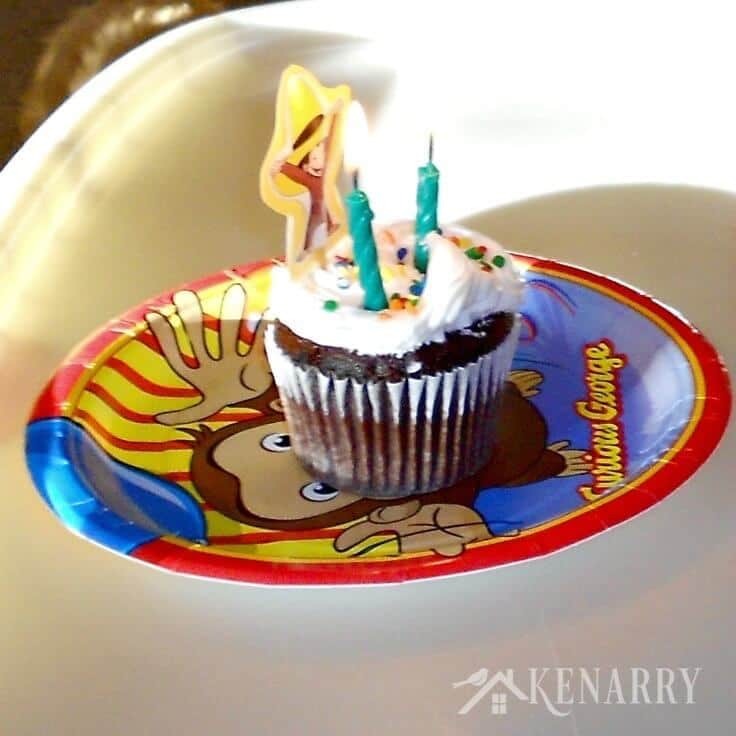 I wasn’t blogging when he turned two, so the quality and quantity of my photos for this post aren’t the usual you’ve come to expect on Kenarry. I still thought sharing it might spark a few ideas for those of you planning a Curious George birthday party for your little ones. There’s just something special about that curious little monkey isn’t there? Maybe it’s the fact that he’s non-verbal so our toddlers can relate? I love that there are no bad guys in the Curious George cartoon either – just an overactive monkey who innocently gets into everything. You’d think that man in the yellow hat would eventually learn it’s a bad idea to leave George alone for any period of time! When C1 was turning two years old, it was his absolute favorite show to watch. When your child’s infatuated with Curious George like that, you have no choice for his or her birthday but to go with a Curious George party. 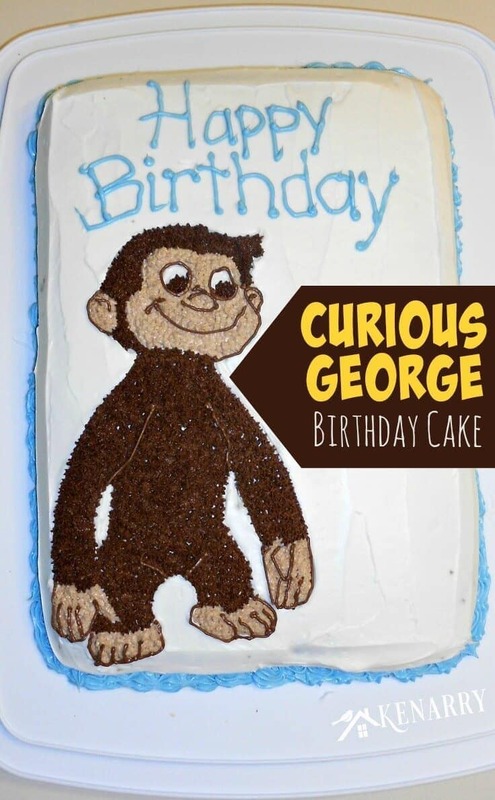 Making a Curious George birthday cake is actually easier than you’d think! 1. Bake the cake. Follow the instructions on the cake mix box to bake a 9 x 13″ cake. 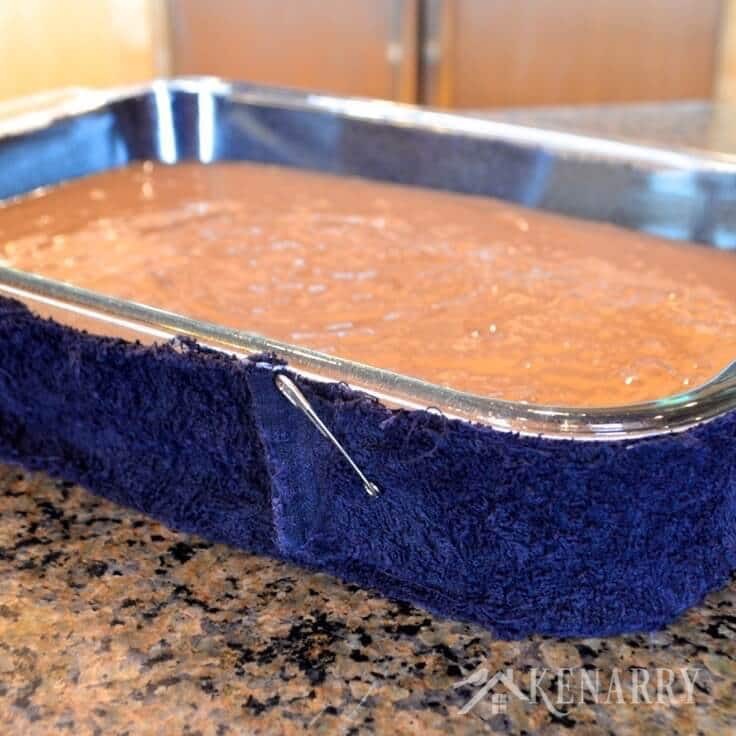 I suggest putting a cold, wet strip of terry cloth around the cake pan prior to baking. This will help the cake to bake more evenly and prevent it from rising in the center. because it has a lid you can use to cover the Curious George birthday cake once you’re done frosting it. Spread a layer of white frosting across the top and sides of the cake. If you move your knife in the same direction as you frost the birthday cake, it will keep you from pulling up cake crumbs. 3. Create Curious George. Find and print a large picture of Curious George. Cut around the outline of Curious George so you just have his silhouette. Carefully place the silhouette where you want George to be on the cake and trace around it with a toothpick. 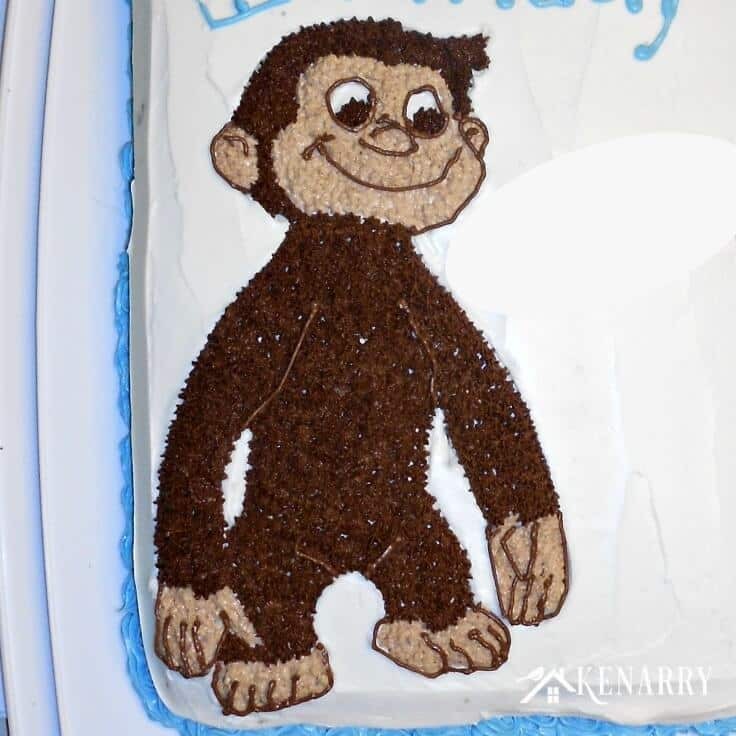 Remove the paper silhouette and use the toothpick to draw the remaining details of Curious George in the frosting on the birthday cake. Next, mix a little chocolate with white frosting. Put a star tip in the end of a decorating bag and fill it with the light brown frosting. Use that to fill in Curious George’s face ears, hands and feet. Put a second star tip in the end of another decorating bag and fill it with chocolate frosting. Use that to frost George’s head, body, arms, legs and eyes. 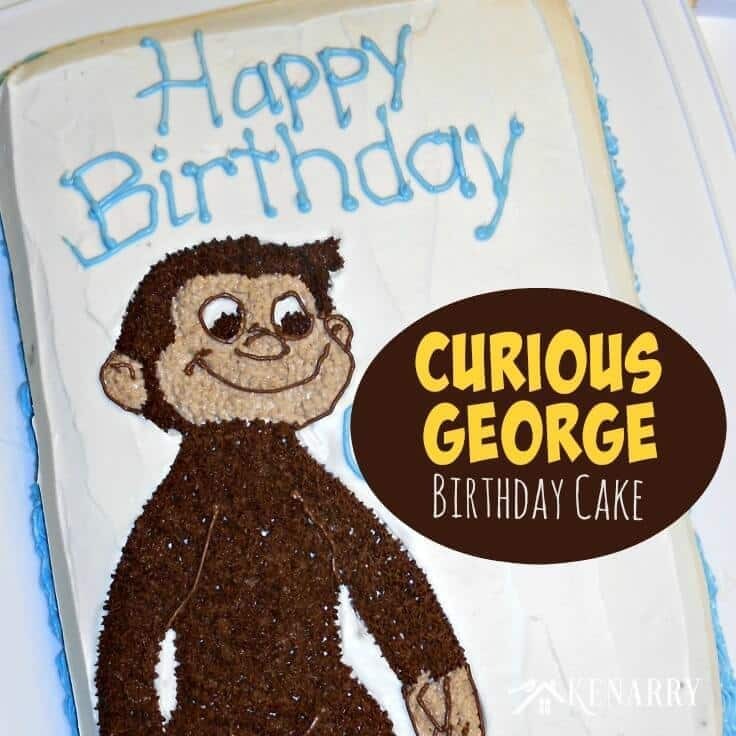 The last step for creating Curious George is to use a regular decorating tip with another decorating bag filled with chocolate frosting to outline George’s features. 4. Add trim and letters. Lastly, I mixed blue food coloring with white frosting to create a light blue frosting. I used a star tip in a decorating bag to trim the edges of the cake. Then I used a regular decorating tip to write out “Happy Birthday” and my son’s name. My son and I were both incredibly pleased with how it turned out! Then we had the second larger party on the weekend with family and friends. 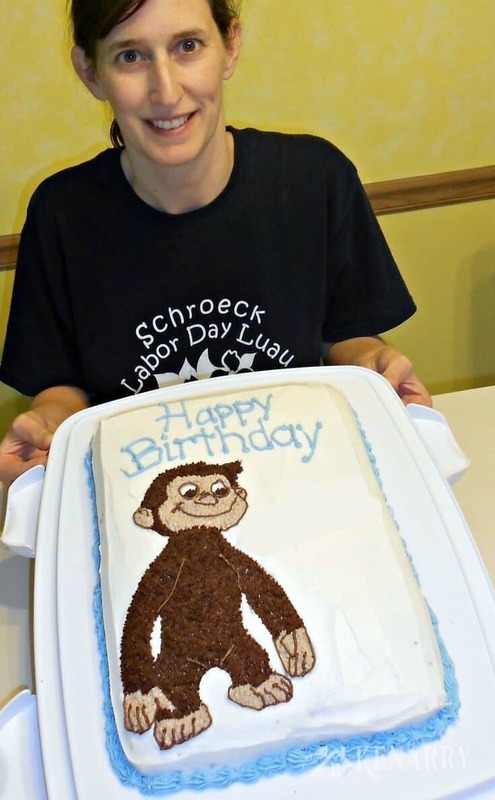 That’s where I served the large 9 x 13″ Curious George Birthday Cake. Thanks, Ashlyn! This technique would definitely work on Paw Patrol characters. Maybe just pick a main one and make it big if you haven’t tried to make a character out of frosting before? Cute ideas, Carrie! I love the cake you made. Thank you, Amy! It was fun to make.